You’re set up and comfortable using Xero, so it’s time to push outside your comfort zone and see what else you can do to ensure you’re getting the most out of Xero. You’re set up and comfortable using Xero, so it’s time to push outside your comfort zone and see what else you can do to ensure you’re getting the most out of Xero. Note: Screen capture from Xero used with permission. © Xero Limited and affiliates, 2013. Xero® is a registered trademark of Xero Limited. Xero dashboards let you view your overall business performance and key financials at a glance. If you need more detail, click on the many available links and drill down further. Identify dashboards that show useful information for business decisions, and review them regularly. 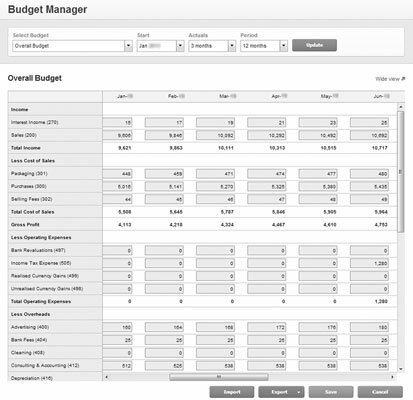 A new 12-month annual profit and loss budget for the next financial year can be created from the Budget Manager dashboard. Ensure any business accounts with bank feeds have been connected to Xero, which will help to minimise data entry. Create bank rules, and use add-on solutions like Receipt Bank to extract data from supplier bills, and import them (along with the scanned image of the bill) to Xero. This accelerates the reconciliation process. Utilise electronic batch payments to minimise the time it takes to process payments and simplify the reconciliation process. Don’t slow down when you hit unknown transactions — click the Discuss tab, leave a memo for the accountant, and move on. Encourage businesses you do business with to adopt Xero so you can send your invoices directly to their Xero system. Ask them to share with you their Xero network key so you can connect the Xero files and enable a small portal so billing information can seamlessly flow between the systems. This will save you data entry time. Once you’ve selected these options, click the blue button labelled Update and then sort the column headed Action by clicking on the header link. All contacts tagged as ‘Created’ are new to Xero for the relevant period. Export budgets into spreadsheets, edit the data as required and then import the budget back into Xero. ‘Favourite’ the Budget Summary and Budget Variance reports so they appear on the reports drop-down menu and you can access them quickly. This way you can easily adjust your budget on a regular basis to react to actual data. It’s important to allocate the correct tax code to every general ledger line in your chart of accounts so transactions are recorded correctly. To quickly update tax codes, use the Change Tax Rate button found on the Chart of Accounts dashboard. Select the tick boxes to the left of the general ledger lines and click the button labelled Change Tax Rate, select the new tax rate, and click the green Save button. All tax rates have been updated. Regular invoices and bills can be set up on a repeating basis and saved as a draft. Or, at the other end of the spectrum, you can approve and send sales invoices automatically so you can move your business model to automatically invoice clients on a regular basis, ensuring cash flow is maintained. Using this feature you can back date and generate invoices as necessary. Use the contact grouping feature to help identify and build relationships with your contacts. Contact groups could be monthly subscribers, advertisers, sponsors, or any group relevant to your business. Contacts can span across multiple groups. You can send identical invoices or bills for all businesses in the same group. For example, if you rented 80 identical dorm rooms, the residents could be grouped and a single invoice could be raised and issued to them, which saves you heaps of time! Identify useful categories in your business to track. Add these to Xero’s Tracking function and allocate them to any asset, liability, equity, expense or revenue transactions. You can monitor the performance by specifying the tracking criteria across numerous reports in Xero. This means you can track transactions across Balance Sheets and Profit and Loss statements. Every so often it’s good to check in with a Xero Hero — a specialist who lives and breathes Xero — who can jump in and look at your system and ensure you’re getting the most out of it! You can find a Xero Hero listed on the Xero website.